Your company can build stronger connections with website visitors through corporate identity design by Dynamic Digital Advertising. Powerful corporate identities, that are also consistent with your real world marketing campaign, encourage longer visitor times. These longer website visits give your company the opportunities to make better impressions and exert more influence over whether a particular visitor takes the desired call-to-action. Dynamic Digital Advertising’s professional website design and development process builds this type of effectual corporate identity. From graphic design and search engine marketing to content development and programming, DDA creates the online experience that advocates your ability to fill the needs of website visitors. Corporate identity websites involve more than placing a current logo somewhere on the page. The right graphic design for corporate identity provides company recognition, and also asks what ideas and feelings do you want people to associate with your company. Websites that are fully-custom designed by Dynamic Digital Advertising create corporate identity through the talents of a number of skilled professionals. DDA graphic designers provide familiarity through the website’s aesthetic design, while DDA website architects make your website as easy to use as possible. Our content developers generate copy that provides the information visitors want, while our programmers construct high-end tools such as e-commerce enablement and zip code locators. As a result, corporate identity and custom website design by Dynamic Digital Advertising works to impress visitors and persuade them to do business with your company. Call one of the nation's leading custom website design companies, Dynamic Digital Advertising, today to learn more about how our corporate identity website design can improve corporate reputation and enhance product branding. Dated or irrelevant graphic web design detracts from the professional image of your company. You may appear out-of-touch with technology or website visitors may have difficulty connecting your website graphic design with your brand. Dynamic Digital Advertising’s graphic design artists create contemporary designs which can take your present marketing material to the next level or maintain consistency with your current brands. Furthermore, DDA can turn graphic elements into interactive elements with animation, e-brochure FlipBooks, or virtual reality. DDA’s graphic design services impress website visitors and raise their opinions of your company. If your website doesn’t offer the information people want, visitors will quickly abandon your website. Worse still, poor website information reflects badly on the competence and professionalism of your company. Dynamic Digital Advertising maintains a staff of degreed copywriters who work to understand your industry for the purpose of providing the comprehensive pages of information that your website visitors want to see. DDA copywriters also craft taglines and mission statements which convey your capabilities as well as your core values. E-commerce, referral services, brick-and-mortar store locators, and Extranet are all valuable corporate-identity enhancing tools. Allowing customers to shop on your website, see prices, and find the places where they can shop in-person serves to build customer loyalty. Extranets, additionally, encourage repeat purchases because Extranets provide a higher level of service. Dynamic Digital Advertising programs these capabilities not only to increase the usefulness of your website but to advocate your professionalism and technical competency. 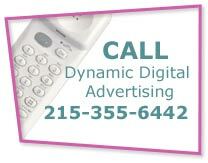 design today by calling Dynamic Digital Advertising. Dynamic Digital Advertising leads the digital marketing and promotion revolution with high-end graphic design services for a range of marketing media. DDAs graphic designers are degreed and experienced in their fields, which include computer generated illustration, radical trade show graphic design, digital illustration, virtual reality, trade show graphic design, large format graphic design, and more. Graphic design services by Dynamic Digital Advertising are an excellent vehicle for capturing the attention of a target audience and convincing them to buy your companys products or services.